The electrolysis apparatus is used to demonstrate experiments in electrical charge/discharge and energy conversion. Use the GENECON as a power source to separate water into its component gases. The compact design makes these units stackable for neat, easy storage. The tank is molded in one piece from clear resin with stainless steel electrodes sealed in place. This unit includes Gencon 12. 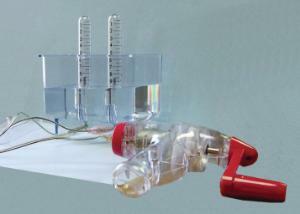 Also includes two graduated test tubes 15x105mm and a resin test tube holder. Specifications: Main Unit: AS resin with fixed stainless steel electrodes; Dimensions: 120x80x100mm; Inner Dimensions: 115 x 70 x 70 mm.